The plain white background (not ugly by any stretch of the imagination) of the main page stands in slight contrast to the extremely exciting content that can be found at the SlotsAngel Casino. The website immediately highlights the games that are especially worth exploring as part of the Angel's choice section. The nice thing is that many of the games can be played as trial versions. The front page also features some of the promotions that can be accessed on the website. The security on the website is top-notch. Therefore, the players can rely on the venue when it comes to delivering the games. The promotions section has some good things in store for the visiting player. After a two-minute registration, the player can take advantage of the welcome (SlotsAngel Casino Bonus) offer. 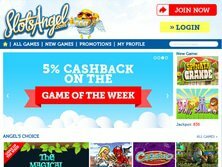 It turns out that depositing using a promo code (Bonus Code: ANGEL) can result in a 100% Bonus up to £25. There is an additional free spin bonus that goes along with it. Twenty-five free spins are available for use with the Magic Forest game. Lately, the website has been offering 5% cashback (Coupon Code: GOTW) on the game of the week. Specific games are mentioned for particular weeks, so that players can plan accordingly. A real cash deposit is required. A £10 gift is given to anyone who chooses to refer a friend to the website as part of another deal that can be seen at SlotsAngel Casino. At the very bottom of the page, the visitor can see the payment methods that are deemed acceptable here. The large credit card companies are represented, as expected. Therefore, the player can use these services in the process; Visa, MasterCard, Maestro, EntroPay, PayPal, PaySafeCard, Neteller, etc. An trustworthy SSL protocol is used to guard the payment card details. 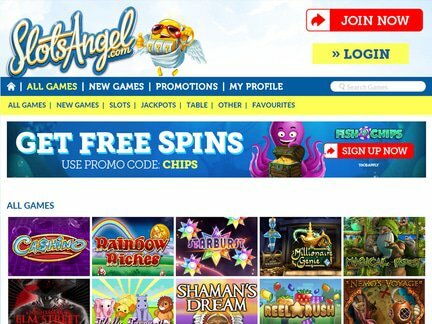 The United Kingdom is the primary target market with the Slots Angel Casino site. In fact, it is the fastest growing slots-offering entity in that country. But the UK-focus does not in any way mean that players from other locations will be denied access. On the contrary, the casino welcomes players from many different locations. Due to credit card fraud that originated in some specific countries, the casino has the right to close the accounts of players from these locations (This is just a sample of the larger list); Albania, Bosnia, Bulgaria, Croatia, Russia, South Africa, Indonesia, Lithuania, Romania, Latvia, Serbia, etc. In addition to these inconveniences, the players from certain other countries won't be able to open an account with the casino. In this case, the rule applies to the following countries; United States, Israel, Turkey, Spain, Denmark, Italy, France, Gibraltar, Belgium & Antigua. The games that have gained the trust of many players have been highlighted here; The Magical Forest, Cashino, Angel or Devil, Nemo's Voyage, Fluffy Favourites, Enchanted Prince, Spinata Grande, Enchanted Prince, Starburst, Spinata Grande, Jack Hammer, Rainbow Riches & Millionaire Genie. The contact details are difficult to access. They should not be hidden in such a way. But there is a toll-free number for UK-based players. The players from elsewhere have to rely on a contact form. An instant help feature is also available. However, a login is necessary to see it. Some players have complained about a lack of response from the staff. Be extra cautious! The casino has been granted a license from the Government of Gibraltar. Aside from the shortcomings of the customer support service (a very important thing indeed! ), I did not notice any negative features in terms of the provided content. In my opinion, the games are nicely selected. Roughly the same thing can be said about the promotions. But the welcome bonus could surely be better. When I compare this deal with what I've seen elsewhere, I remain disinterested in accessing it. If the casino staff wants the visitors to be more optimistic about the casino, a change of course in necessary. The reform should start with the improvement of the customer support and end with the introduction of a better welcome bonus.